There are 211 reviews of Seyvillas. The service was good. The reservation process was quick and accomodation was as permissed. I loved the Seychelles. Especially the nature and the Indian ocean. People are very warm. I saw very nice Rasputin bird for the first time. Georgette was a very friendly host and did everything to assist and help us during the stay. There are two houses for the guests. The separate house is the best for privacy but the main house was also great. The apartment was comfortable and clean. Large room. Beautiful views from big terrace. Very peaceful and quiet, had a great sleep. The beach is right in front of the apartment. Convenient with a supermarket next door. Busstop just in front of the main building. Breakfast was good and varied. Grilled whole fish for dinner was the best. Really enjoyable vacation! Palvelu toimi sujuvasti ja ystävällisesti.Kaikkiin kysymyksiin vastattiin nopeasti ja tarjottiin sopivasti vaihtoehtoja. Kaunista oli ja ihmiset ystävällisiä.Sääli että korallit kuolleet,mutta rannat upeat ja vesi lämmintä. Siisti,kaunis maisema huoneesta.Kallis ja palvelusta jäi hieman pakotetun ystävällisyyden tunnelma.Oppaan viesti ei koskaan tavoittanut meitä.Kasvisruoka ei ollut hintansa väärti.Lähellä satamaa,mutta auto tarvitaan liikkumiseen.Emme menisi uudelleen. Hinta/laatu kohdallaan.Siisti ja ystävällinen palvelu.Puolihoito hyvä,kasvisruoka oikein maukasta ja vaihtelevaa.Sijainti oikein kätevä.Pyörällä pääsi joka paikkaan.Rauhallinen.Voisimme mennä uudelleen. Erittäin ystävällinen palvelu.Jopa korvatulpat varattu yöpöydälle jos naapurin koirat häiritsee.Puhdas ja siisti.Hieno maisema.Liikkumiseen auto välttämätön.Ehdottomasti menisimme uudelleen. Kaikki toimi sopimusten mukaan ja erinomaisesti ajallaan.Oppaat sekä lentokentällä että saarilla hotellissa käydessään teki kaikkensa,jotta viihtyisimme ja saisimme hyvän esittelyn kohteesta.Lentokentällä lähtiessä nuori miesopas vei läpi lähtöselvityksen,esitteli lentokentän ja järjesti käynnit jopa suljettuihin kauppoihinkin.???????? very efficient and helpful. all questions answered. seychelles is a great place we have been going for some 40 years. However on la Digue they are now over tourist accessing the island. what was once peaceful is now swamped with bicycles and too many tourists. the pleasure of the small island is fast disappearing. la digue lodge is starting to get tired. we have been regular for many a year. the food became repetetive and badged with a different name in the evenings. the reception area is very tired and needs updating, and dissappointingly for the cost no wifi in the bedrooms, which generally can be found elsewhere in the world. staff were attentive and good. The service was excellent, prompt helpful and you found us a room that I couldn't get through other agencies. We loved the Seychelles and found it very laid back and beautiful. It needs to do more to improve environmental sustainability especially recycling and reducing plastic usage. We loved this hotel. Very convenient for the port, clean, beautiful pool area, good snorkelling and delicious breakfast. We stayed 3 nights,the hotel was great the food,location and stuff trying to help all the time. it is a great hotel ! We came after 4 nights in Cerf island resort the difference is unbelievable from a very low quality hotel thats want to take as much as possible money from you to Kempinski that is trying to make your vacation as good as possible food drinks rooms stuff. i highly recommend Kempinski !!! Sey Villas organisation was very good, your handlers Creole were efficient and helpful. All went smoothly. Great destination for a rest, but overall would not return. OK but looks a little worn. The service was patchy . Lack of detail no one to bring in the sun lounger cushions so consequently when they got wet no one could use them. Great Hotel, good service, good food lovely spot. Hotel again looking worn and in need of some maintenance. We were very lucky and had Room 1 on the beach I would not have liked to be across the road. Excellent service from staff brilliant food would recommend Bliss to any one, if you got a room on the beach side. I was very satisfied when I booked the trip. The responses came promptly and we were recommended a hotel on the right side of the island where it comes to the winds and the amount of seaweed. The transportations ran smoothly and on time. The only place where we were taken slightly to the wrong place was at La Digue and we never met the guide there. The chalets reception was not were the chalets are but on the next property and because there are no signs at the reception we could not find it and we had to wait for an hour until someone came to the chalets. We loved the islands and recommend warmly an island hopping tour. It felt as if we had three different holidays. The islands are so different. This was probably the best location by the beach on Beau Vallon. You can go and swim directly from your room and this is not possible at any other place on this beach. So many people walked by and stared at the rooms of this house because it was so unbelievable. There is a double bedroom and a bedroom with two separate beds and a toilet upstairs. Both of the bedrooms have AC. The double bedroom has a balcony and stairs that go up to a tv-corner. The bed was very good. The kitchen, bathroom and a seperate toilet are downstairs with a small living room and the terrace. The terrace door has to be locked when you are not downstairs and you have to close it when you go to swim. The door was very stiff and I could not lock it without the help of my husband. The beach is public in front of the place and pretty much anyone can walk in if you leave the doors open and are not there yourself. Very clean accommodation and you can order breakfast if you want. Breakfast service begins at 8.30. There is a small supermarket near and all the other services are near. The stairs to the second floor are steep in a Dutch style. This place was SOOO nice. All transfers were on time and ran smoothly. On La Digue we were taken directly to the O'Soleil chalets, not the reception where the owners live. We had to wait for an hour before we found anyone because we did not know where the owners lived and could not find anyone. We were there at 10.30 am, but because we could not find anyone, we could not leave our bags unattended and go and kill time at the beach and had to wait at the hot garden. Gessica was really kind, nice, patient and helpful. Everything was perfect but Wi-Fi was horrible and ants were really annoying. Owner was very friendly and nice as well. This was our second visit to these beautiful islands, and after this, we still can't get enough. Definetely coming back again. The reservation process, and the communication were proessional! We had luck about the weather, just a little rain just nights... The people, the flora, the sea, the athmosphere of the islands was gorgeous. There are many tourists, but not on the shore, so like an untouched nature. The service offered was exactly as expected. Information was prompt and accurate. The culture and nature were very impressive. We enjoyed the new experiences of living and eating with the locals. We had a great choice of things to do with some great scenery. Before we booked we read many great comments about how the owners did that little bit more than expected to assist their guests. This was exactly what we experienced. The accommodation was very clean and our room was always made up each day. We asked for assistance to hire a car for 1 day and within 2 hours there was one sitting outside for us to use. One example of the attention to detail was on out checkout day we had a very early collection to go to the airport. We were given a "breakfast bag" which was really thoughtful. The sunset views on the terrace where brilliant and the breakfasts in the morning will always be remembered. The transfers to and from the airport were good and on time. The drivers were friendly and gave good information while we travelled. SeyVillas made my booking experience very easy. I found all my required accommodations all under one roof. The Seychelles is so much like the Caribbean in culture and climate, but that much nearer to Europe by plane. The population were of mixed ethnic groups and were all so friendly. All the islands have so many wonderful beaches, the wildlife is just there waiting to be photographed, and there is history everywhere from slavery to missionaries, from French colonialism to English colonialism to independence. It is all there in the Seychelles. The only downside is that for snorkelers, a lot of the coral is dead or dying, but fish still remain in the area. Many Lemon sharks and rays can be seen and we were lucky enough to see a turtle making her way back to the water after laying her eggs at the top of the beach. Nice clean residence with swimming pool and within a short walk to Beau Vallon beach and the local market. A gem of a place just across from the top of Beau Vallon beach and a bus-stop to Victoria almost outside the gate. Lovely caring staff offering help with laundry and directions. They even put mosquito repellant burners outside the rooms in the evening to prevent you from getting bitten. Breakfast is basic choice but adequate given the warm climate. We would happily stay here again. Absolute must see Praslin island due to the friendliness of people, the cleanliness and also the nature that protect. The destinations as a whole we think is heaven. Personnel was welcoming and friendly. Perfect service and location. Beach is in arm's length. Very kind staff and nice service. The apartment is spacious. Excellent service, very helpful and friendly and professional staff . Everything was great. After much research we decided with booking accommodation and transfers through Seyvillas. We are from the UK and can honestly say the service from enquiry through to the whole holiday experience has been exceptional. The ease of site, booking the days you want under island hopping and the accommodation choices based in budget was outstanding.once initial enquiry was raised response received with 12 hours with confirmation of availability. Streamlined service for payments and prompt communication in relation to vouchers, transfer times, fast ferry options. Thank you Seyvillas, would definitely recommend you to anyone travelling to the Seychelles that wants flexibility outside of the normal package company restraints. Wonderful..we went straight to Praislin after landing, onto La Dique and then to Mahe. Fabulous location, and people. Would recommend hiing a car on Praislin and Mahe. Its the only way to see the islands and experience the real culture of the islands. Worth mentioning that although you can build a holiday based in budget it is expensive when there. Excellent location at end if road in Anse Colbert Cote d'or. Minute from beautiful beach and shops restaurants. We booked a Deluxe room, worth extra. Great buffet breakfast with lots of choice, small pool but ideal for end of day swim and drink at pool bar. Pizzeria on beach very good for cool drink or food with great staff. Room was large but shower over bath had to be removed from bracket however it didn't spoil experience or location. Fabulous...tropical oasis in the sun. Although 500m down a track from road, beautiful place with large gardens well looked after and a great pool. Perfect for a stop during the island cycling especially in the heat. Elody the owner ensured everything was cared for, from details of island, arranging cycles to be delivered and although only had eve ing meal once outstanding food. Perfect location as very close to L'union estate and Anse Source d'Argent. SeyVillas and all its staff have been excellent from the very start of our booking and right through our trip to the Seychelles. The staff were extremely helpful and informative with our booking. Any questions were answered very quickly. The location of our guest house in La Digue was perfect and SeyVillas sets excellent standards with there listed properties and local people. The Seychelles is a magical location, with amazing local Creole food, fantastic beaches and interesting Jungles. The locals of the Seychelles were very helpful and friendly people, always helpful with advise when needed. Doris and Charles run one of the very best accommodations I have had the pleasure of visiting around the world ( I do travel a great deal !) The welcome by Charles at the local jetty was unexpected and much appreciated. The Guest house is set in some wonderful gardens, full of beautiful local birds ! The facilities and our room were spotless, a real credit to all the hard work and attenshion to detail by this couple. The breakfast were amazing, a wide variety of fresh fruits, pancakes, eggs and local fresh bread made an excellent start to the day. Charles was also very helpful sorting out bicycles for us which made getting around La Digue very easy. A fantastic Guest House run by a fantastic couple. We love Seychelles, it's like paradise on Earth, most picturesque beaches and crystal clear water to swim, delicious fruits and fresh fishes, friendly people. Good service, friendly staff, as expected. Booking was easy, information sent through was comprehensive and everything was slick. Eating out was a bit expensive but always good, the people were friendly and the hotels excellent. La Digue was so relaxed although I would recommend taking torches for the evenings as the streets were unlit and none of the bikes seemed to have lights. Mahé was quite busy by comparison! We particularly liked the nature trail and we also had a cocktail lesson there. It’s not something they do regularly but they they are thinking of doing it as an option. The staff were very good, the hotel lovely. It was a little remote from the rest of the island though. Perhaps next time we would choose somewhere nearer a town. The pools were both good, one with great views and the other quieter. The transfers all worked really well but the one on Mahé from the ferry to Valmer was in an old bus that rattled a lot and the driver drove quite quickly. Seyvillas were able to recommend the best locations depending on the season and picked very suitable accommodation for our needs. They responded promptly to any emails and it was all seamless. Large resort style hotel. Rooms modern and clean. However, we couldn't swim in the sea during our stay due to red flags and the food was a bit bland and mass produced. Muy agradable alojamiento. Las habitaciones son funcionales pero agradables, amplias y limpias. La localización es muy conveniente. Justo enfrente de la playa (hay que cruzar una carretera) y a un paseo de la zona de bares de Beau Vallon. El desayuno completo y fresco. El equipo muy agradable y servicial. Tiene espacio para aparcar dentro del recinto. Excellent from start to finish,island hopping needs many transfers etc.but everything worked without a hitch. Nice friendly hotel,good beach and swimming (despite some seaweed problems ) Great bar and bar-staff,our favorite apero spot of the holiday! Excellent spa. Stunning hotel,the greeting on arrival set the tone.Fantastic room right in the jungle,great food and service and a lovely spa.They don`t have a good beach but make it up with their ``beach harbour`` and a superb pool area.Quite expensive but it was so good it did`nt seem to matter! Beautiful beach villa and great beach and swimming but some disappointing aspects.Generally a bit run-down and in need of a facelift.We thought they took too much advantage of their exclusive position eg.no walking outside the resort allowed without an expensive guide,no access to the village shop,charges for bike hire (one could only ride around the resort !) and minigolf etc.etc.For an average meal for two in the Japanese restaurant we paid 350.-Swiss francs! Of course, we still had a good time there (the streetfood evening was excellent ) but of the three hotels,this is the least likely that we would go back to. Everything worked like clockwork, one delay of 45 minutes sitting in the bus on arrival at Mahe airport probably caused by other passengers,otherwise excellent.One even started to enjoy the rugby scrum of reclaiming luggage after each ferry transfer! I like to thank the Seyvillas team for there support from booking till the checkout of the Villa, They always answered my queries and also helped us with all the information required. In CERF island , Rita was not available but her son Dominic helped us a lot with the greetings , welcome drink and showing all around the villa and also giving more info on things to do on the island and also was smooth with handling things . loved the villa and the staff for there helpfulness. Seychelles , World of islands . Its was the tourism day we landed in this beautiful island, greeted by the airport staff with creole dance .Our journey begins and we stayed in this country for 9 days travelling 4 most loved islands (mahe, praslin,ladigue and Cerf) . we have covered almost all of the beautiful beaches and other places which are attractive , we did hiking and had been to anse cocos , swim in the natural pool of anse cocos. snorkeled in the St.Anne national park. we feed the tortoises in moyenne island . So many memories we have taken back with us memories which are well captured in pictures . We loved the people , laid back islands, landscapes food and experience . Already most of our friends are planning for seychelles trip , we also like to visit this place again. Loved the villa with all the required items, Rooms , kitchen are pretty clean and also with kitchen utensils which are required but one rice cooker was missing. But anyway we managed with other utensils. Awesome place to stay and hear the beautiful songs of birds and the view of the cloud covered Mahe island was superb , loved the island with very less people and privacy. Website is clear and gives good information. Responce on the bookings is also clear and quick. The Seychelles: beautiful nature, friendly people. Self catering houses are very good and nice equipped. Self catering houses are clean, very good and nice equipped. Friendly manager (Pierre)! Beautiful garden. Hotel with nice, clean rooms. Very nice staff. Good breakfast and diner. The outside of the building needs a refurbishment. The place where everything looks like on a postcard just much more better. Peace of heaven. Beautiful, tidy, having one of the best locations for real relaxation place. We were amazed how apartment personnel takes care on every detail. We felt like beeing among people we can trust and much more, like among persons we know for a long time, they were smiling, helpful and simply enjoying to do their best for us. Hope you see this post, THANK YOU SO MUCH. Hope to see you again. Organizing our honeymoon with Seyvillas was a perfect decision. Great communication, prompt answers and quick reply to our inquiries among other positive aspects such as a wonderful webpage for organizing island hopping around Seychelles. Thank you for making our honeymoon true!!! Paradise on earth... landscapes, beaches, food, exotic fauna and flora. In order of preference, Mahe, Praslin and La Digue. Be ready for some action in case of renting a car! Unfortunately our stay in La Digue and in the Honeymoon Suite was not as expected... Facilities of the hotel old fashioned, they do not have a club car and almost all of the rooms are up in a hill. We rented bikes and they were terrible! No maintenance so far, even had an accident because of the brakes. Be prepared for cockroaches at night if you stay up in the hill. The breakfast was the worst of our sta in Seychelles, as well as the dinner we had there... At least the beach nearby the hotel was beautiful. Great service booking through the website. And fairly straightforward. The Seychelles is amazing, particularly La Digue, would love to go back. Fantastic hotel, enjoyed every minute. So pleased we stayed here rather than anywhere else, staff were great, the Pizzas at the restaurant were insanely good! And the beach and facilities were top notch! Very helpful and prompt service from first enquiry and easy payment method. All very efficient from beginning to end. My only comment is regarding food options: as a place in a island, I expected much more seafood options for either appetizers and main courses, mainly in the beach bar/restaurant. But all other attractions in the resort are very good. It was very nice to get the helpful information beforehand from Seyvillas (packing list etc). It's an absolutely beautiful place. I loved the beaches of course, the glorious sea, the lush tropical landscape, and the (mostly ) laid back people. My favourite island was La Digue, it felt so unspoilt. Beau Vallon seemed big and commercial in comparison, but it had other charms; people watching on the beach, the closeness to Victoria, the Wednesday market. The Beach House was made very special by the kindness and personal care of Cecile. The room was very big and had everything I needed, and it was great to hear and see the sea from my veranda. Jayda cooked me a beautiful meal one evening. Communication was good once we began to speak to each other by email but I was under the understanding that confirmation would be within 24 hours then find that the acceptance of the booking was within 24 hours and then I was told that I would hear within 3 days if it was confirmed. As this was a late booking this was no good and so, through email communication, we managed to get it confirmed in the following 24hours. We saw only 3 of the islands but thought they were all delightful. La Digue was a little disturbing in terms of the local hospitality in some cases being rather resentful. Otherwise both other islands most hospitable. Disappointing. The chalet smelt musty when we arrived and didn't appear to have been aired before arrival. The receptionist seemed insistant that we needed to book all of our requirements, tours, car hire etc through her and this was all before we had been shown to our room. Whilst some of the kitchen fridge, crockery, pots and pans etc appeared to be new the bathroom felt like it needed an upgrade and we did not get hot water for any of our showers during our 4 day stay. We were told that this was due to the weather however, after day 1 the sun was shining constantly. On day 2 we were asked if it was ok if our room wasn't serviced as they were short staffed. We did agree as we felt sorry for the reception lady as she said she was going to have to service the room, but it is not what we expected for the price we had paid for the room. The location is great, just a few minutes walk from a lovely stretch of the beach and with shops nearby if self-catering. Great service and very fast replies on any questions. Always quick and informative response. Lovely country with beautiful nature and kind people. Flawless service. Owner really did his best to make us feel comfortable. Due to a misunderstanding, we were about to miss our flight to our next destination but he really did everything possible to make it in time to the airport. Very impressive! Clean, generally helpful staff, I have dietary requirements and they changed menus to suit, lovely location quite remote but we preferred that. We loved La Digue, and La Surmer was equally laid back, more basic but large spacious villas that some might say needed updating but we enjoyed the laid back vibe, Great location. Very happy with all my interactions with the staff there. Each time I asked for anything, the reply was prompt and helpful. Loved the Seychelles, the natural beauty is unmatched. Breakfast was great, always served with a smile. My room was lovely, large and clean. The beach is great for swimming during high tide. I stayed in the honeymoon suite which was it's own separate little villa. It surpassed my expectations. The location is very pretty, the breakfast was good and evening meals too. Entertainment on Thursday night really let you get a feel for the locals. The staff here is wonderful, breakfast buffet is good. I liked my room, it was very clean and quiet there. Would surely recommend the services provided by your team. The accommodations provided were very comfortable and clean. Very well located with friendly hotel staff. Clear waters and lovely people. This sums up our journey to this beautiful island. SALUT SEYCHELLES. Quick and friendly and helpful. 3rd time there...stilll the paradise from earlier days...though the number of tourists seems to have tripled it is still chilled and relaxed. Cecil is the best...even drove me to the dentist;-)) Best value for money!!! We miss the nights on the veranda across the beach...we will be back!!! If you prefer to stay away from people this might be the place for you, too. Just six rooms/villas equals to max 12 people that might cross your way. You need to rent bikes though...it’s a 10 minutes ride to the Jetty and La Passe. The staff is small and very forthcoming...make you feel “home” very quickly. Everything worked out flawlessly. Very friendly people! Will go again with SeyVillas! The service is totally OK, not extremely good but fear enough. Few points I would do better: For this week, they did not give new shapoo and I was run out of shampoo in two last days. Some morning there were some lack of items on breakfast like no coffe cuops, pancaces were finished. Extra positive points for shef making excellent omelets! Nice weather, sun is what you search and that is what you find. Was in time and very friendly. Service of SeyVillas was fantastisk. CreolTravel was everytime here where we arrived. It could not be better. We think Praslin and La Digue er the best places in the world if you like to be on a beach. Everything is clean. A lot of fishes and corals. The water around Cerf was not so clear but there where small sharks and skates to see in the night. Not so good on Cerf was the low frequent sound day and night which came from the other side on Mahe. It looks bad for me with burning oil to make electric energy. We booked 4 nights and there was only one boat tour for free. I think we'll not return to Cerf. There is a neighbor with 3 dogs and sometimes a lot of noise. The road in front of the garden was a surprise. The apartment was very good. The apartment was amazing. The owners were very nice. Very nice place and staff. Good breakfast. We are very satiesfied and can easily recomend the place to other. Good value for money, good location, nice apartment, very spacious. The personnel at seyvillas did a brilliant job and i would recommend them to anyone. this was my 5th trip to seychelles but it will probably be my last. It has changed for the worst in 2 aspects. 1. It has become far to expensive. My previous trip was 6 years ago and prices for everything has increased by 100-150% that is just daylight robbery. I personally dont understand how the locals with average jobs will be able to afford a living in the next few years if it keeps going at this rate. 2. To many foreigners. 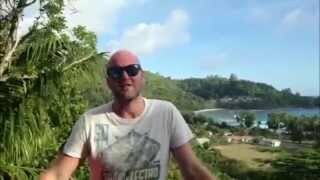 I am not talking about tourist but about foreigners living and working in seychelles. I have always felt welcome in the past by the locals as they are friendly and always willing to help and share a smile. But now as a tourist i have to deal with unfriendly non locals which i flooding to the seychelles. Especially beau vallon and victoria is the worst hit im my opinion. Probably one of the worst places i have stayed in on my travels. The hotel is in a bad state with maintenance needed on all fronts. The main restaurant serves food which is tasteless and not worth it for any prices. The staff is unfriendly and seems more like they are unhappy slaves then wanting to help and give a great service. Taking into account the price you pay there are much better accommodation for a better price.